Two of our returning Olympians competed in their preliminary rounds this hot and humid morning at the Maracana Stadium. 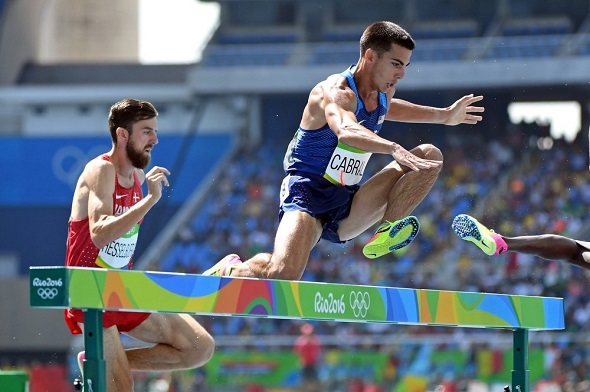 Cabral joins American teammates Evan Jager and Hillary Bor in the Olympic final, a first for the American men since 1936. Jager was also in the London final with Cabral, becoming the first American men to do so since Henry Marsh (1984 and 1988). The final will be on Wednesday at 10:50AM ET. Muhammad Halim had eyes on making his first Olympic triple jump final, something that he fell shy of back in London. Unfortunately, he was not able to get a legal mark as he fouled all three of his attempts. The top 12 competitors advanced to the finals, with a mark of 16.61 meters making the cutoff. Halim’s personal best mark is 16.99 meters. This entry was posted on Monday, August 15th, 2016 at 5:46 pm. It is filed under Olympics, Spotlight. You can follow any responses to this entry through the RSS 2.0 feed.